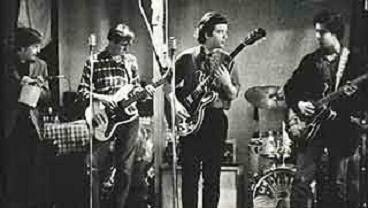 If Stacy Sutherland of the 13th Floor Elevators were alive he’d be celebrating his 65th birthday this May. 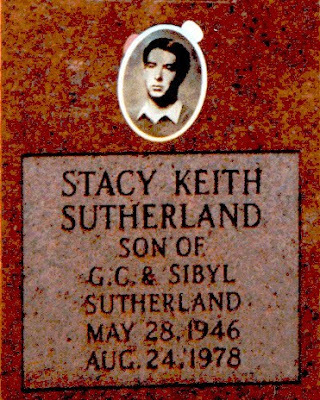 Stacy Sutherland tombstone, Center Point, Texas. Image from Mindspring.com. HOUSTON — On the corner of Pacific and Hopkins streets in the east Montrose section of Houston is a vacant lot with an untended vegetable garden. The lot was the previous site of a Craftsman-era bungalow that was recently demolished due to neglect. In this house lived Stacy Sutherland, lead guitarist of Texas’ legendary psychedelic music pioneers, the 13th Floor Elevators, and if Sutherland were alive, he would be celebrating his 65th birthday this May. 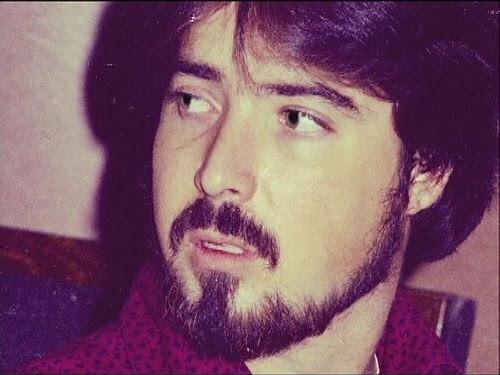 Known as the soft-spoken member of the band, when the introspective Sutherland did choose to express himself, he did so not only with his thick central Texas drawl, but also with his reverb-drenched leads that cut through the band’s wall of sound, and whose sustained notes seemed like they would never end. His signature guitar style appeared on four 13th Floor Elevator albums and countless live performances from Austin to San Francisco. But Sutherland had another side of his personality he kept hidden deep inside and that was known only to those close to him. Stacy Sutherland. Image from Emerald Wood Archives / Flickr. Montrose is a neighborhood still in transition whose early 20th century architecture has all but vanished. Once considered a “hippie neighborhood,” by the late 1970s this inner city community was approaching the eve of gentrification, with each neglected bungalow soon to be torn down and replaced with several modern townhouses per city lot with no particular continuity regarding their style or design. Long time Montrose resident and small business owner Robert Novotney recalls a Montrose in the 1970s when rents were “cheap” and a party atmosphere prevailed in the neighborhood seven days a week. He also recalls a “repressive” police force that was always on the lookout for “longhairs” to harass and search, as well as a neighborhood where home invasion by the criminal element was a common occurrence. “I was broken into once and I had friends that were always getting broken into because they had these nice stereos that you could hear from the street because nobody had air-conditioning back then and they always kept their windows open and it invited burglaries,” Novotney said. Stacy Sutherland’s all too short life journey can be traced back to his early days in central Texas, when he used to skip high school and practice guitar all day on the banks of the Guadalupe River that flowed through his family’s ranch in Kerr County. 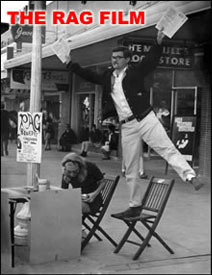 Sutherland also spent a brief period in Port Aransas one summer performing with the Lingsmen, a band that included future Elevator drummer John Ike Walton, as well as future bassist, Benny Lynn Thurman. When Sutherland joined the 13th Floor Elevators, his personal journey took him from the live music clubs of Austin in the 1960s, to the Avalon Ballroom and the Fillmore Auditorium of San Francisco and eventually to Houston, where he found himself out of money, out of luck, and on the skids. The 13th Floor Elevators performed together from 1965 to 1969. The band’s core membership and songwriting collaboration always included Sutherland on lead guitar; Roky Erickson, vocalist and rhythm guitar; and Tommy Hall, electric jug, lyricist, and spiritual advisor. Sutherland was a survivor. He survived the turmoil of being in a band signed to a record label whose owners engaged in questionable business practices, numerous arrests for drug possession, an addiction to heroin, and seven months of incarceration in the Eastham Unit of the Texas Department of Corrections near Huntsville. 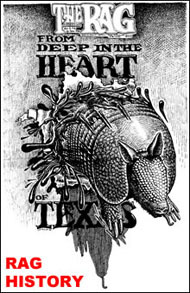 In exile from his central Texas home of Kerrville, in 1975 Sutherland decided to find refuge and a change of scenery in Houston. Houston was very familiar turf to Sutherland. 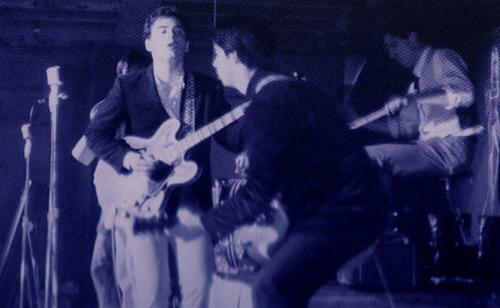 The 13th Floor Elevators recorded in Houston studios, as well as performed countless concerts in Houston nightclubs. The band also lived communally for a time in an old mansion located on Old Galveston Road owned by their record label and known as “Funky Mansions.” However, what really drew Sutherland to Houston after the demise of the Elevators was the fact that it was home to Ann Elizabeth “Bunni” Bunnell. Ann Elizabeth “Bunni” Bunnell. Photo courtesy of Jim Hord. “She was brilliant and a member of MENSA,” said longtime friend and former Montrose neighbor, Jim Hord, “but she couldn’t handle the everyday little things in life. Bunni displayed bad judgment in men and had a lot of slimeball friends.”Bunnell was a New Jersey transplant to Texas whom Sutherland initially met in the late 1960s during the time he lived in Funky Mansions. She was an “exotic dancer” who took the name “Bunni” when she danced at the “Boobie Rock” on Houston’s lower Westheimer Road. Bunnell was now working as a typist supporting herself and her two children from a previous marriage, and studying to be a court reporter at night. Sutherland and Bunnell rekindled their relationship in the summer of 1976, and settled into east Montrose where rents were affordable, drugs were plentiful, and crime was rampant. The next year, on Sutherland’s 31st birthday, May 28, the couple married, traveled to central Texas to visit family and friends, and then returned to Houston to resume their domestic routine of volatility and substance abuse. 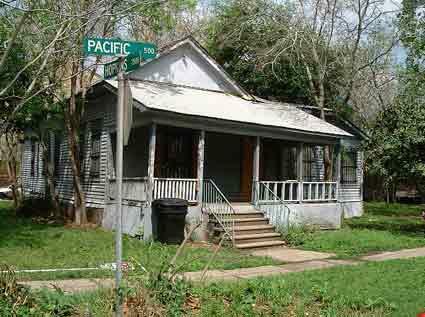 516 Pacific Street, The Montrose, Houston. Photo courtesy of Paul Drummond. Hord remembers Sutherland as someone always toying with the idea of putting another band together, but who went to extreme measures to forgo actually playing music during this unproductive time period. As a frustrated Sutherland sat on his front porch, neighbors were known to come up to him and ask for an autograph, which served as a reminder of by-gone days in the spotlight. “I don’t remember ever hearing Stacy play guitar when I went over to visit. He used to talk about drugs a lot. He had a fascination with drugs, and he would do anything that came his way. Bunni once told me that when she and Stacy used to go out bar hopping in the neighborhood, Stacy would bandage his hand before leaving the house, and when people would buy him drinks and ask him to play guitar with the band, he would have an excuse not to play and sit in with them, choosing to drink all night instead,” Hord said. A Montrose resident was shot to death today in his residence at 516 Pacific Street. Police identified the victim as Stacy Keith Sutherland, 33. Shot once in the stomach with a .22 caliber rifle, at 3:30 a.m., Sutherland died at 5:07 a.m. in Ben Taub Hospital. Officers arrested a 34-year-old woman at the scene. No charges have been filed. Hord believes that Bunnell’s actions were taken as a measure of defense to protect her teenaged son who was staying with them at the time from an irrational acting and inebriated Sutherland. 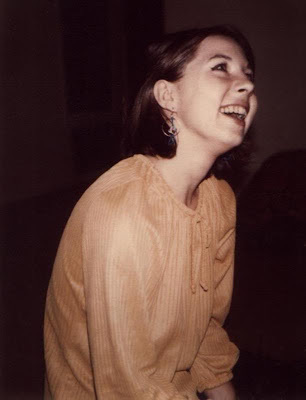 On April 10, 1981, after seeing evidence and hearing arguments from council, the Honorable Judge Frank Price of the 209th District Court of Harris County issued a motion for dismissal to Ann Elizabeth Sutherland for the murder of Stacy Sutherland. More than two years had passed from the time Bunnell was indicted for the felony offense by a Houston grand jury, and according to Bunnell’s attorney, Audley H. Heath, “because more than 120 days had passed since the commencement of the action, the defendant was entitled to a dismissal of the indictment filed in the cause in accordance with the ‘Speedy Trial Act of 1974’ of the Texas Code of Criminal Procedure.” This statute was later repealed by the Supreme Court of Texas in 2005. Sutherland died before experiencing the worldwide recognition and the accolades now paid to him and the 13th Floor Elevators from adoring fans, musicians, and the music press. Their music has found a new audience from an entirely new generation, that discovered the band and the body of work they recorded, from that brief moment in time they performed together. Sutherland is buried at Center Point Cemetery near his family’s ranch in Kerr County, not far from where he used to practice his guitar on the banks of the Guadalupe River. Bunnell eventually became a court reporter, remarried and continued to live in the house at the corner of Pacific and Hopkins streets in east Montrose where she died of cancer in 1987 at age 43. The 13th Floor Elevators — Tommy, Bennie, Rocky and Stacy — at the New Orleans Club in Austin, 1965. 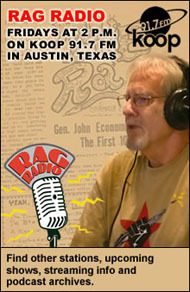 Photo by Bob Simmons / The Rag Blog. Roky Erickson, Stacy Sutherland, and John Ike Walton perform at La Maison in Houston in May or June, 1966. Image from last.fm. 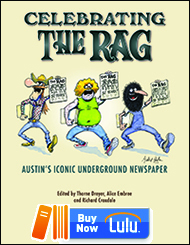 This entry was posted in Rag Bloggers and tagged 13th Floor Elevators, Houston, Ivan Koop Kuper, Montrose, Popular Music, Psychedelic Rock, Sixties, Stacy Sutherland. Bookmark the permalink. The death, the struggle; to me a damn shame. Stacy Sutherland, born on May 28th. My Birthday as well. I was fortunate enough to have met Ann in my restaurant (The Spirit 24 Hour Cafe at 243 Westheimer) in 1978. She gave me solace and some guidance through the several years of our acquaintance and my young adulthood. Thank you for this, Koop! Great story. Great writing.